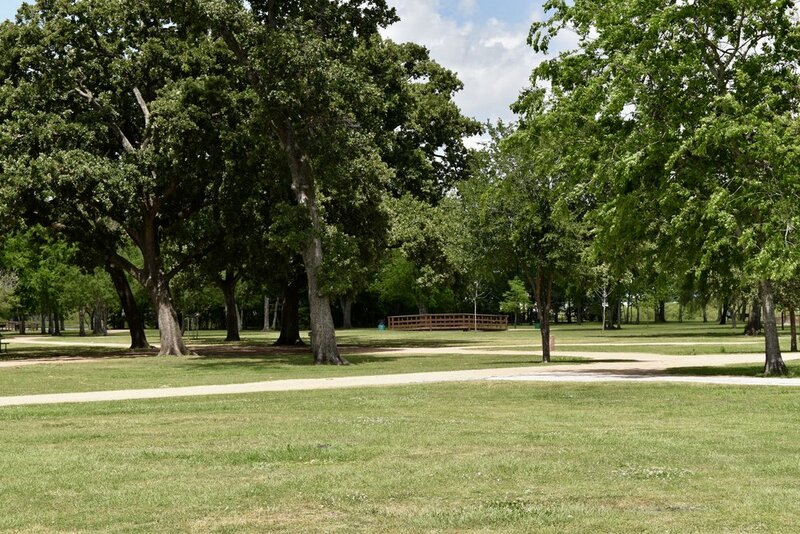 7400 West Sam Houston Parkway S.
Arthur Storey Park is a 175 acre park off of Sam Houston Parkway in West Houston. Situated along Brays Bayou, its detention is ringed with a hike and bike trail that is just short of two miles. A playground, Tai Chi court, picnic tables, duck pond, gazebo and restrooms round out the list of this park's amenities. We stopped by this park while out running errands and had no idea what to expect. Unfortunately, our visit did not begin well as we were greeted by construction noise, trash everywhere and a horrible smell wafting from the detention pond. However, as we were walking back to the car after finding a decent place to eat our lunch, we happened upon this wonderful Tai Chi space. Somehow, despite the noise from the highway and nearby construction, this area of the park had a feeling of peace and tranquility. There were several large oaks providing shade and I was really glad that this was our last stop before leaving the park. I was immediately turned off by the gator warning signs. With small children, this is an animal that simply make me nervous (This is probably the reason we haven't braved Brazos Bend State Park yet!). In addition to the aforementioned observations, the park was just too crowded. Kids were practically on top of one another on the playground. It reminded me of an elementary school playground at lunch time. We were there on a Friday afternoon and while it was nice to see so many people enjoying the outdoors, the patrons clearly did not respect the park as trash littered the ground. We would also like to point out the upon reason other reviews of this park, we discovered numerous accounts of car break-ins and a general consensus that it is not safe to walk alone in the park in the early morning or evening hours. This park is definitely not our best Houston find.